When I saw the recipe for Fiery Kale with Garlic and Olive Oil on the Kitchn blog I knew I had to make it. As I’ve mentioned before, we really enjoy “spicy” and so the minute we see that a recipe suggests that it will heat up our taste buds, we’re all in. In the last few years, kale has become very popular — there are countless recipes for it in almost every magazine. But, we were on the kale bandwagon long before kale became a trend. In fact, our purchasing history for kale goes back more than 20 years. It was a staple in our household. There was always a huge bunch in the fridge’s vegetable drawer. Ironically, we never tasted it. Then what did we do with the kale? Bubba was our oldest son’s pet iguana. Our son brought him home from the pet store as a tiny 8-inch lizard. Bubba immediately let us know he was very discerning when it came to his food. He refused to munch on anything other than fresh kale and fresh carrots with the ferny green tops. For the kale, our son had to cut out the hard stem and tear the leathery leaves into bite-size pieces. The fresh carrots had to be grated and sprinkled on top of the kale. If it wasn’t just so — he would pout, step on his dish and upend it. This was his way of telling us exactly what he thought of his meal. One time we ran out of fresh carrots and our son substituted bagged carrots instead. He sniffed the contents of his dish, shook his head then stepped on his bowl dumping the entire “salad”. Bubba turned around and lumbered off to lay on his heat rock. By that time Bubba was 4 feet long. We had him for twelve years before he went to his big garden in the sky. 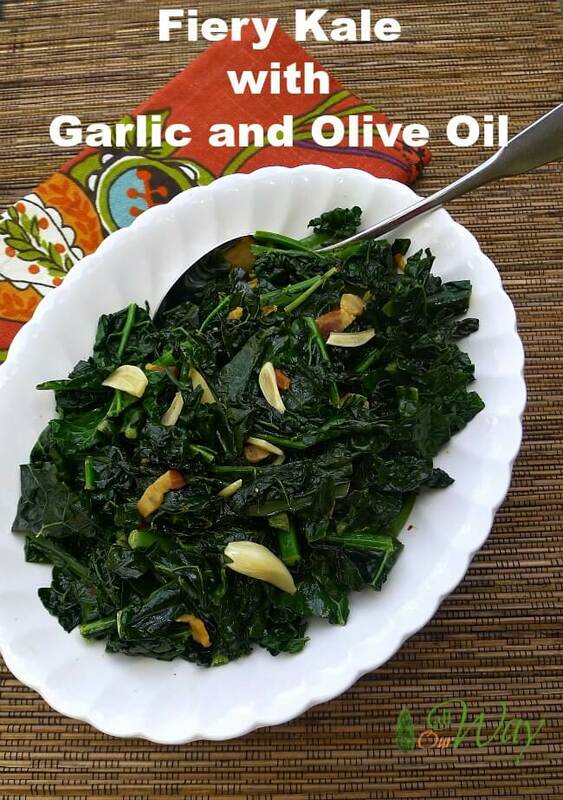 I wished we would have had the Fiery Kale with Garlic and Olive Oil recipe all those years ago. We could have been enjoying that delicious green along with Bubba. Our iguana knew something about kale we hadn’t realized yet — how delicious it can be. If you don’t like spicy, you can control the heat by decreasing the crushed red pepper flakes. And instead of the pancetta, you can use bacon or hard salami cut into 1/4 – inch strips, whichever you prefer. Just make it “Your Way”. 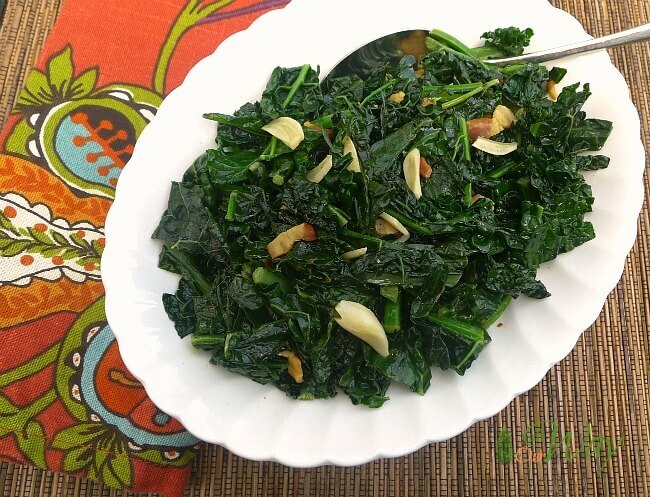 A spicy kale recipe that is sauteed in olive oil with garlic, red pepper flakes, and pancetta. Heat the oil in a large, wide high-sided sauté pan over medium heat. Add the garlic, pancetta, and red pepper flakes and sauté for about 3 minutes. Be sure not to burn the garlic. Turn up the heat to medium high and add the kale and the chicken broth. Cook stirring often until the leaves turn from leathery stiff to shrunken soft strands of deep, dark green, about 8 to 10 minutes. We always have kale at home – we use add it to everything lol – so this dish is definitely right up our alley. Can’t wait to try! Looks very tasty. Oh my gosh this sounds yummy to me … my hubby makes his own pepper flakes and puts them on everything and am very partial to garlic. I am going to grab a bag of kale and make it his week! I often cook spinach this way but have not tried making kale this way. What a great side, especially to steak. Love the garlic and bit of heat in this recipe. I will have to pick up kale up next time when I shop and give this a try. Might be a great addition to bibimbap that the kids have requested for Christmas Eve dinner. 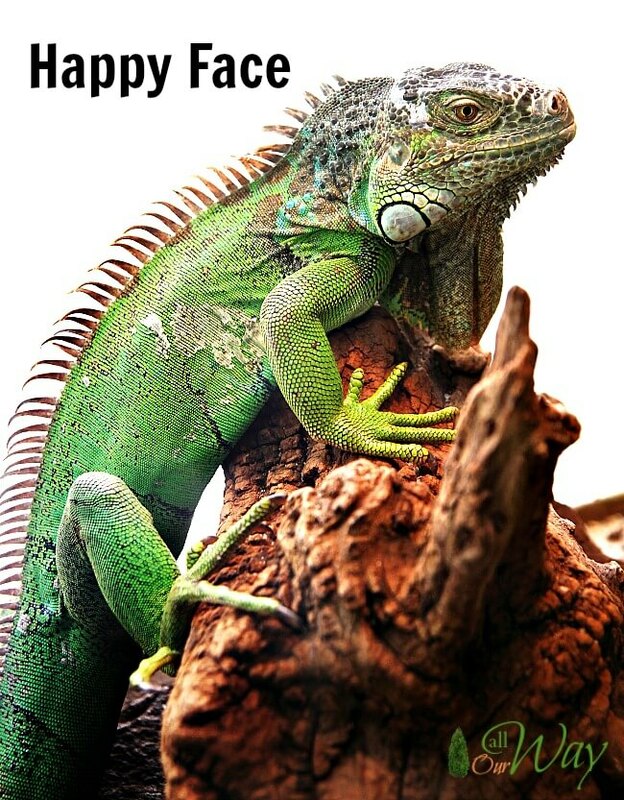 Nice to read about your pet iguana bubba! Now this is a recipe I would love to try! We love it nice and spicy!! Next time I buy kale, i m definitely making this! When I met my husband, he hated all things green. Strangely enough, I’ve gotten him to tolerate KALE. I make mine very similar to this! Such a great recipe idea! My husband would love this too. Definitely saving for later! My fiance is always asking me to make this dish) now, having the recipe, I have no more excuse))) Thank you for sharing! You’re welcome, Veronika! I hope he enjoys it. Hi, Karyl! Bubba was a real character — he must have had gourmet taste — he ate kale before we did. Such a cute Iguana!! Not a big fan..! Honestly I’m scared of them! My kids want a pet but .. we have no place in our home.. and because I work with cakes I try to keep things to the minimum. Way to spice up a rather bland green! It looks and sounds like it would be very popular in my house too, anything to increase the heat works for us! This sounds great! I bet the garlic cloves are to die for. I love that it has a hint of spiciness. Yum! Love the story about Bubba! I never realized kale could be tasty until a few years ago. This dish sounds yummy! I love this post and the story about Bubba – hilarious! Who knew someone would have such a personal connection with kale! This spicy version sounds yummy! Thank you, Helene! Bubba is very spoiled! He’s stubborn and gets angry if he doesn’t get his food when he wants it. The kale is very good. If you don’t like spicy you don’t have to put as many pepper flakes in it. We have so much kale in our garden and I am running out of ideas! Thanks for this great new impulse. I will try the recipe tonight! Hi, Kiki! That’s great that you’re able to grow your own kale. I miss our country garden. Great pic of the kale! Just looking at it makes me hungry! Thank you! I never thought I’d like kale as much as I do — I hope I don’t turn green like Bubba. Looks delicious! I’ll have to give that a try! Scrumptious!!! 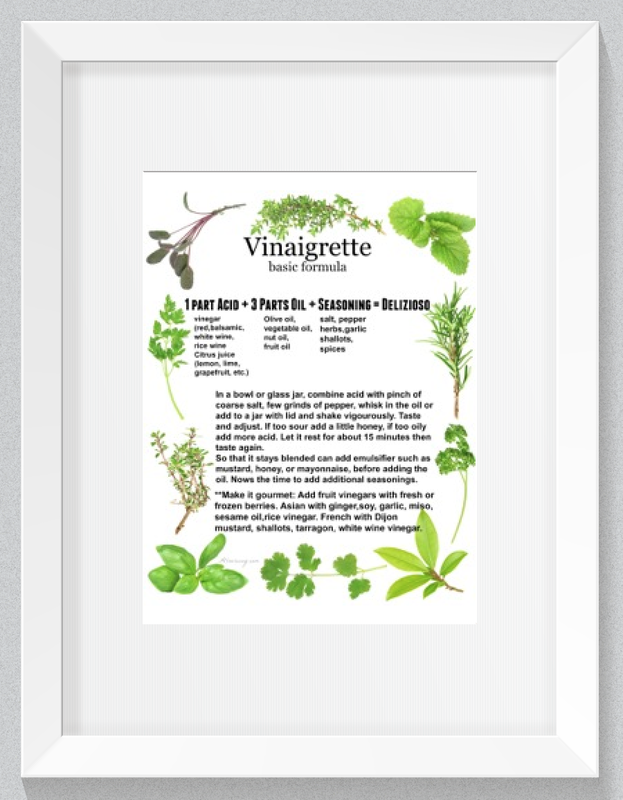 I have Kale in the garden so I’ll be using this recipe when it’s harvested! YUMMY! You will have so many delicious recipes to pick from. Are you going to let us know what is in your garden?? That is such a hoot about Bubba and the carrots. He was a gourmand too! Sounds like a great way to eat kale. Your dish looks delicious! I’ve never had it cooked before, let alone jazzed up with delicious ingredients. You’ve peeked my interest, so I’m going to have to give this a try. I have all the ingredients, except the kale – but I can easily pick some up tomorrow. I’m a big fan of red pepper flakes,so I think they make a great addition to this dish. Yum! I hope you had a wonderful weekend, sweet Lady! Oh you will love the spiciness of it! And if your little ones liked Bubba they would have love Gidget — she started out as a itty bit boa and ended up eight feet long — but that’s another story and it WAS my son’s pet. The same one who had Bubba. 🙂 Don’t ask me what I fed it. Great post Marisa, Bubba must have been something to see! 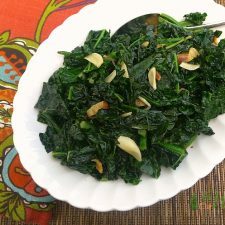 This kale recipe sounds and looks delicious, one I will be trying for sure. Thanks Happy Memorial Day to you! Did you plant kale in your huge garden?? Wish we had room and to think I used to complain about gardening! Now this is how to give kale some taste. I love the story of Bubba – wow- four feet long? Lots to feeds there. Your recipe has several delicious ingredients in it. I’ll have to make it this way the next time I have kale on hand. Oh he did eat a lot — kale in those days was cheap. Le me know how you like it.